Cook bacon until crisp. Drain on paper towels and set aside. Add butter, onions and garlic to bacon renderings, cover and cook over low heat, stirring often, until the onions are translucent and lightly caramelized. Add wine, stock, bay leaf, and thyme; brig to a boil and simmer 30 minutes. Remove the bay leaf and puree the soup in a food processor or blender. Chill. Whisk in the cream, crème fraiche or sour cream. Season with salt, white pepper, Tabasco, and nutmeg. Add lemon zest and juice to taste. Serve in chilled bowls. We serve this soup hot. If you choose this option, use cream or crème fraiche, not sour cream, so the soup won’t curdle. Husband and Fellow Innkeeper John and I have a stayvacation each year when the Alaskan branch of the family arrives. Our family’s experience reminded me of what a great venue Buckhorn and the Smokies are for summer fun. 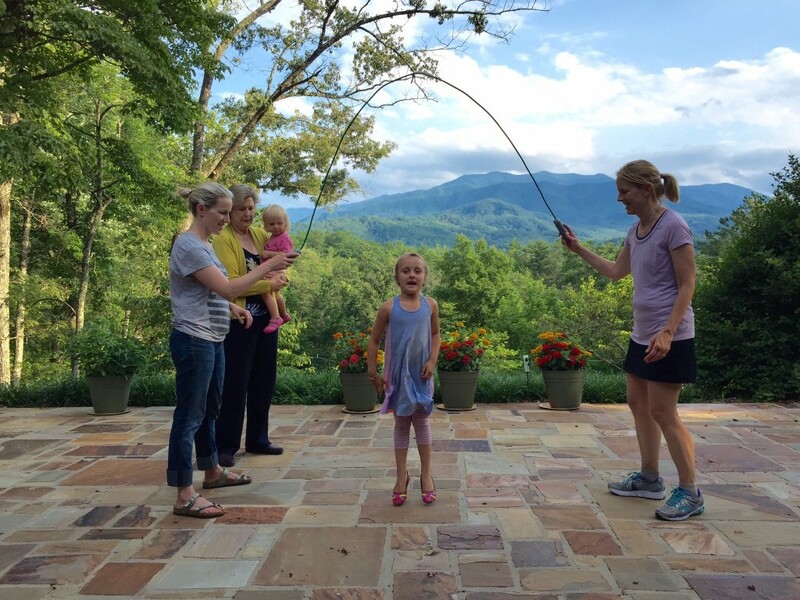 This year we gave 5 year old great granddaughter Jane skip roping lessons on the veranda of Buckhorn House with her mom, granddaughter Jessica, me and Alice and our daugther counting out cadence. We hiked the Inn’s nature trail, did morning runs, played games on the terrace, enjoyed hearty breakfasts and an elegant dinner served in our private dining room so the four under 10 great-grandchildren could make as much noise as possible and not disturb other guests. We did two hikes, played golf and mini-golf, rode Gatlinburg’s new Mountain Coaster (TWICE), played Pickle Ball at the Gatlinburg Recreation Center, attended a riotous show at Dixie Stampede, and had lunch at the Mountain Lodge, a family tradition. Reviewed 3 days ago This place was so beautiful and relaxing. We stayed in the blue room number 1 and it was so cute clean and has a great view of the mountain. The staff is very friendly and welcoming. The dinner was good, nothing outstanding but delicious. The surroundings are stunning and peaceful.